PCOS is a metabolic disorder that affects 5 - 7.5% of all women. And women with PCOS are at a greater risk of heart disease and diabetes. 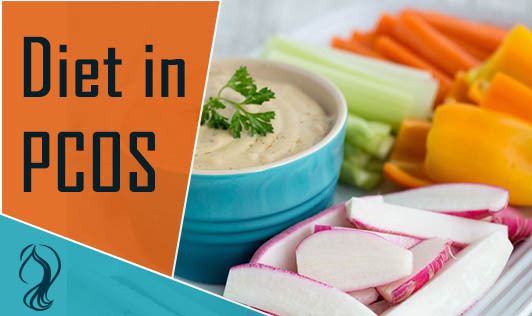 Experts now consider that the best type of eating plan to improve symptoms associated with PCOS and insulin insensitivity is a low-GI diet, based on foods with a lower ranking on the glycemic index. By maintaining stable blood-glucose levels, a low-GI diet also helps to reduce the general level of insulin circulating in the bloodstream and should lead to a gradual improvement in PCOS and insulin-sensitivity symptoms. 1. Choose low-GI whole-grain starches (dense wholegrain breads, brown rice, basmati rice, whole-wheat pasta) and whole fruit rather than fruit juice. 2. Have a good source of fiber. a. Best sources of soluble fiber include apples, oats, and pulses. b. Eat plenty of vegetables and pulses. 3. Flaxseed and soy are examples of plants containing phytoestrogens. Research indicates that these plants, and isolated lignans (proteins) from these plants, have many protective effects on the body. 4. For cooking, choose extra virgin olive oil if possible or any other oil in small quantities. 5. For salads, choose from flax, canola, soy, or extra virgin olive oil. 6. Eat regular helpings of oily fish like salmon, mackerel, herring, sardines, and tuna. Biotin containing organ meats, egg yolk, peanuts, filberts, mushrooms, bananas, soy, peanuts, cauliflower, and whole grains.